Maintaining a rink schedule is a tough task. Maybe you create it yourself by hand or even in a spreadsheet, but all that work can go away with our rink scheduling solution. Our rink scheduling solution is designed with a simple, intuitive user interface. bookarink.us removes the stress of being a rink schedule coordinator. Eliminate numerous phone calls or emails asking about availability. Integrates with SportsEngine or TeamSnap sites. Notifications about reservation changes are sent out. Dedicated support team ready to help you. Extensive documentation and user videos. bookarink.us is an incredibly especially extremely easy turnkey solution to manage all your rink scheduling! bookarink.us allows users to make reservations on rinks which they have access to, based on any rules or quotas in place. Users can manage their reservations (add, edit, delete), and update their profile. System administrators have additional capabilities to configure the system and manage reservations. Choose a feature to learn more about it. Announcements are a very simple way to display notifications to users. An announcement can be configured with a start and end date. Announcements can be targeted to a user group or to users who have access to a certain resource. Announcements can be emailed to users as well. A user creates a reservation by selecting the day and time slot desired. Using Custom Attributes, additional information can be added to the reservation form to be gathered at the time of making a reservation. Blackouts can be used to prevent reservations from being booked at certain times. This feature is helpful when a resource is temporarily unavailable or unavailable at a scheduled recurring interval. Blacked out times are not bookable by anyone, including administrators. Quotas restrict reservations from being booked. If a reservation would violate a quota, the user will be notified, and the reservation will be denied. The quota system allows you to build limits based on reservation length or number reservations. Resources can be anything you want to make bookable - such as rinks. Resource attributes include: status (available, unavailable, hidden), schedule assignment, resource type, sort order, location, description, notes, calendar subscriptions, resource image, and resource color. Resource duration settings include the ability to set a minimum reservation duration, maximum reservation duration, and a reservation buffer. Resources can be assigned to individual users or user groups. Time grids are the overall time slots the system uses. bookarink.us can use the same layout for every day of the week, or you can customize the layout for each day of the week. Time slots can be displayed starting on any day of the week and for any number of days. You can add, view, import, and manage all registered users. bookarink.us allows you to change resource access permissions of individual users, assign users to groups, deactivate or delete accounts, reset user passwords, edit user details, assign specific user reservation colors, and view the reservations of a user. Reports are a method to summarize reservation data. bookarink.us comes with a set of common reports which can be viewed as a list of results, a chart, exported to CSV and printed. In addition, ad-hoc reports can be created. 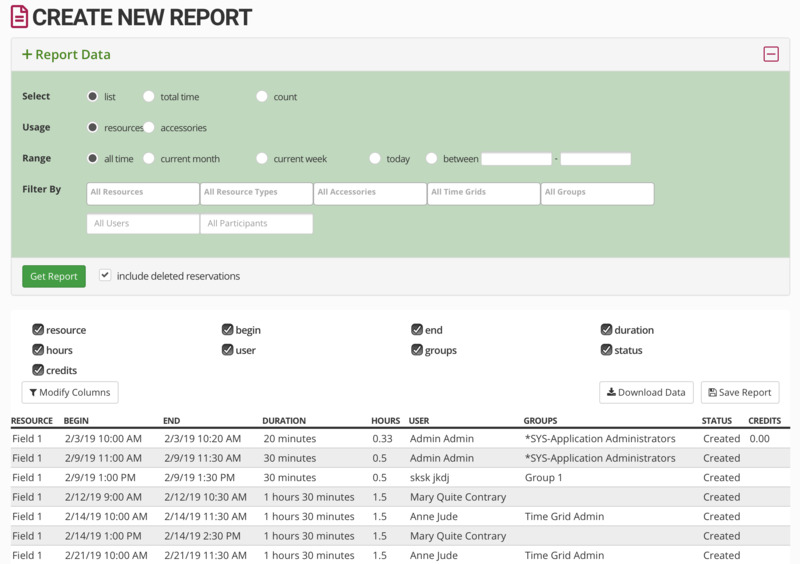 Reports can be saved and accessed again later. 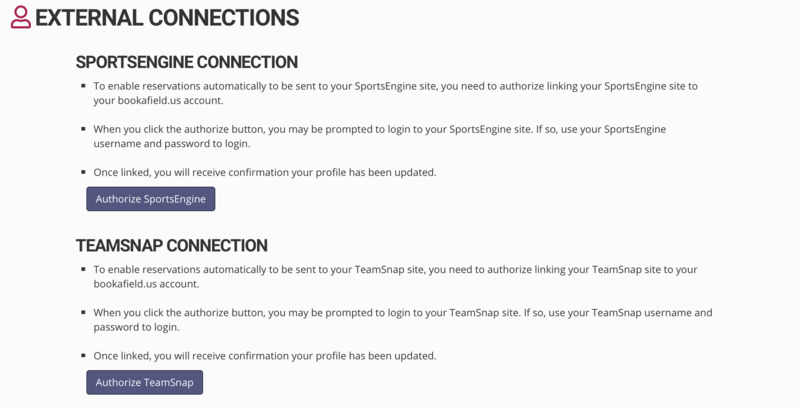 To have bookarink.us reservations automatically be sent to your SportsEngine or TeamSnap site, you can link both of accounts. Through the API, your reservation is automatically (and instantly) updated on your team site. Eliminate the work of updating two systems! Other features available: custom reservation form, user groups, resource groups, resource types, custom attributes, public viewing of a schedule, iCal feeds. Refer to the Package Feature chart as not all features are available in every package. Setting up a spreadsheet is a lot of work to manage and maintain. Mistakes happen, and multiple teams show up to use the same rink. You currently spend too much time trying to schedule teams. You want real time rink availability. We strongly believe in community and non-profit organizations. Our goal is to make it easy for your organization to manage your rink scheduling needs. We have different packages and options to choose from depending on your needs. With bookarink.us, you will have an intuitive user experience, and a powerful online rink scheduling tool. You can upgrade your package at any time without losing any information you already have in your system. Refer to the chart below for package features. The Free package allows a limited number of users, resources, and reservations. The Basic package is designed for clubs/organizations who want an online rink scheduling tool, but don't need all of the options of the Premium package. The Premium package is designed for clubs/organizations who want to customize the program to fit their needs. Unlimited Reservations, Custom Data Fields, Unlimited Users and Resources, Blackouts, Quotas, Reports and many more features! Free Package: Every 6 months you will need to acknowledge your continued usage of your subscription. Accounts over six months old without any activity are subject to deletion. 6 month or 3 month Packages: If you are using bookarink.us for a season, we will put a hold on your account and not delete your data from season to season. There is a one-time charge to add the feature to your subscription account. In addition, there is an added fee for the feature which you can pay either on a monthly or yearly basis. Credits allow control over a user's usage. A rink may be configured to consume a certain number of credits per time slot. If you don't have enough credits, you will not be allowed to complete a reservation. To charge for reservation usage, users can purchase credits. Administrators have the ability to set the credit rates for peak and off-peak times. This allows the user to upload an attachment to their reservation. 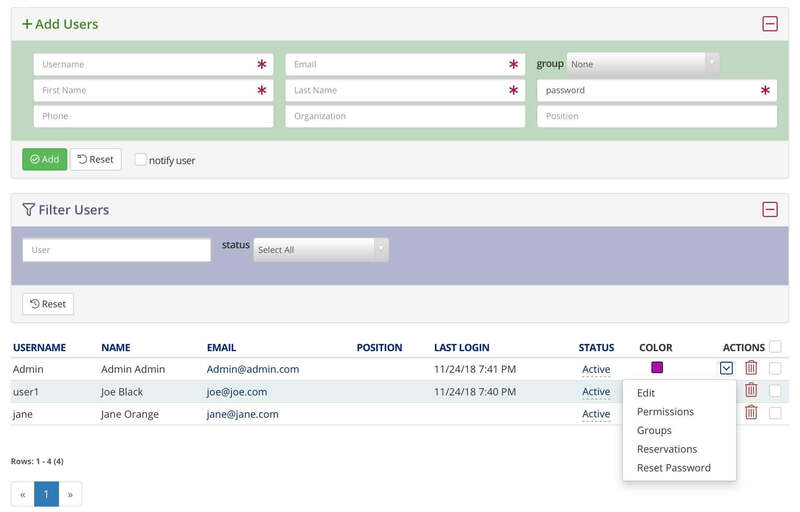 Roles give a group of users the authorization to perform certain actions: Application Administrators, Group Administrators, Resource Administrators, Time Grid Administrators. This allows a user to reserve additional accessories (such as equipment) along with their reservation. This allows you to create custom time slots per day. This creates a direct link between a user's bookarink.us reservations and their SportsEngine team calendar. This creates a direct link between a user's bookarink.us reservations and their TeamSnap team calendar. If you find yourself crunched for time, need some extra help, or would like some one-on-one time, these services can be purchased on an as-needed basis. Please note: Refer to the Package Feature chart as not all features are available in every package. On the schedule, I want to know which team has the reservation, is that possible? Yes! When viewing the schedule there are numerous options available (user name, team name, or custom data field). When placing your order, you have the option of paying for your subscription either by credit card or we can invoice you. Subscriptions must be paid for prior to activating them. We have some rinks for U9/U10 teams and other rinks for the older levels. Can I limit U9/U10 coaches to certain rinks? Yes! You will assign which rinks a user has rights to reserve on. You control the rights users have to your rinks (view only or full control). I need to cancel everything. How easy is it to cancel all reservations and notify everyone? In one action you can delete all reservations for a day, or for a range of days. Whenever a reservation is changed or deleted, the system sends an email notification to all users who had a reservation for that day. At the end of the season I want a rink usage report. Is that available? Yes! There are several different types of reports that can be generated. All data can be exported to a CSV file for further analysis and reporting. Once I purchase, what happens next? Once you purchase, it takes about a day to get your site setup. You will then receive a step-by-step getting started checklist to walk you through each piece needed to configure your site. Our Customer Service staff is available to help you with any questions or issues you might encounter. Does bookarink.us automatically create a game schedule for the season and a tournament schedule? No, bookarink.us does not generate a schedule of games, nor does it generate a tournament schedule. bookarink.us does allow you to import existing reservations. What if I need bookarink.us to do something it currently doesn't do? If there is a feature or functionality you need, we can provide a custom quote to you for the work. 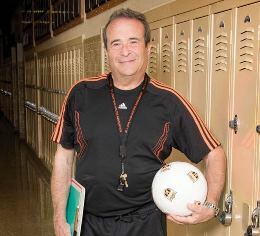 Does bookarink.us integrate with a coach's team site? bookarink.us has a direct integration with TeamSnap and SportsEngine. Any reservations made on bookarink.us is automatically displayed on the team calendar. There are times we need to use the full rink for a game but only use part of the rink for practice. Can bookarink.us accommodate this? Yes! Some clubs divide a rink in half or in quarters and allow coaches to reserve that portion. Other clubs allow multiple reservations on the entire rink. Before setting up your rinks, consult with Customer Service about the best way to do this. Can I upgrade/downgrade my package? Yes! We understand your needs change and have designed flexible subscription packages. For example, if you start out on the free subscription and wish to upgrade to the basic or premium subscription, you will not lose any data. After purchasing the upgrade package, within a day you will see the additional functionality added to your site. I have been a scheduling coordinator for many years. Using this online scheduling program has saved me time and the coaches love it. I can't imagine going through a season without it! Do you have any questions? Would you like someone from our Sales Team to contact you? Complete the form below and we'll be in touch!